Facebook Face Recognition? What’ll they think of next? Yep…It’s coming! 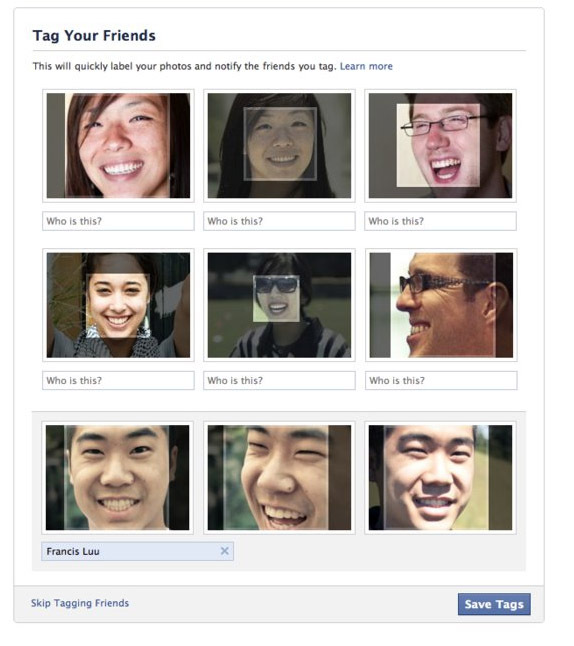 Facebook has installed face recognition software into its system so that when you upload photo’s of you, your friends, and family, they can now suggest “tags” so that you don’t have to go through the process of tagging people. I suppose for some this can be very handy, I know with a lot of “promotors,” when they have to TAG a photo of an event, this would be nice because now Facebook will remember (in theory) the last event photo and all who were TAGGED would be automatically suggested for the next event. Or if you have an upload of a large party and you have several friends who you have tagged previously, Facebook will suggest their names. However, if you have a very “PRIVATE” page similar to mine, you may want to disable this function. You already know Facebook thought this through and has put in the ability to “LOCK OUT” the face recognizer from your Facebook buddies. Because really….some of us don’t want our pals randomly tagging us in their photo’s. I know I get tired of going through and “Untagging.” hahaha! Just kidding! Stay tuned for more updates on this feature! 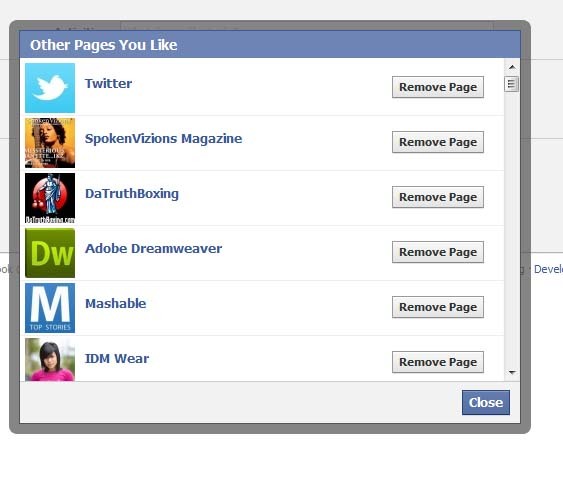 Want to get rid of the likes on your Facebook page? Easy! On the top right click your profile tab, (see arrow in image below) then below your profile photo, click the info tab. 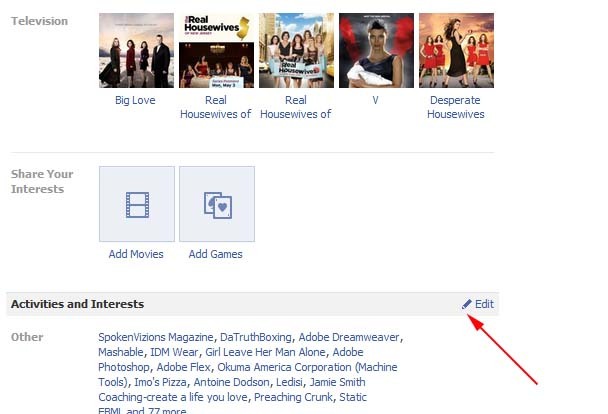 Next, you’ll want to scroll almost all the way down until you get to a section called “Activities and Interests.” You should be able to click the little pencil next to this section on the right hand side which will allow you to edit all the “likes” that you’ve either purposely or accidentally “Liked” on Facebook. 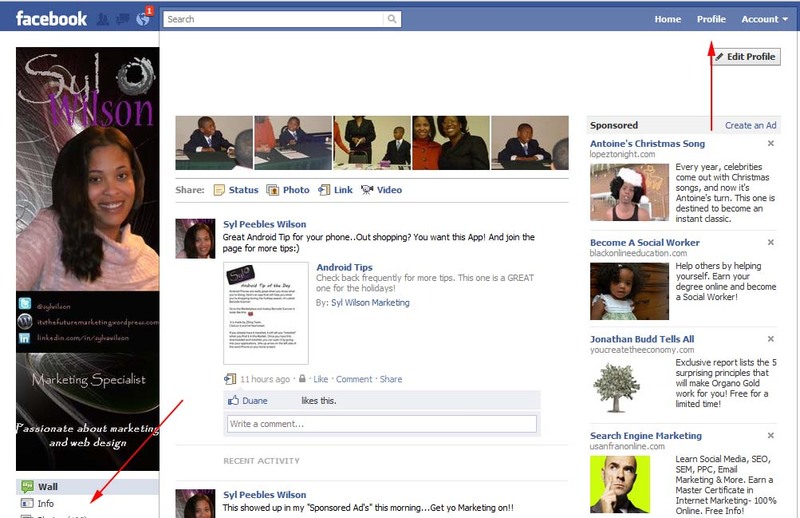 And FINALLY you can get to the COVETED Facebook “Like” pages!!! Now you can remove the ones you don’t want! Here is the screen shot of what it will look like. Have fun and hopefully Facebook will stop changing things on us so we can know where the heck things are!